The ultimate yoga retreat. Up to 10 yoga sessions with Nicole & Heather. Includes river's edge glamping tents, 8 meals, canyon hike, rafting or full-body massage & more! Aiiro wants to invite you to explore a new way of doing yoga. 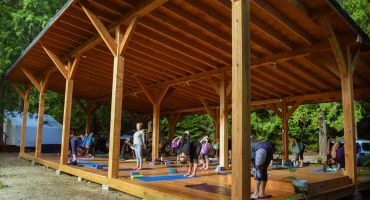 Join us as we travel to British Columbia where you will spend 5-days exploring your yoga practice, riding the rapids of the Nahatlatch river and hiking through pristine British Columbia wilderness. 5-Day all-inclusive retreat of a lifetime. Morning yoga, meditation, acro yoga play, 11 meals, 2 social hours, whitewater rafting, 1-hour full-body massage & more! The Mind Body Freedom Retreat combines the scenic, untouched raw beauty of the Nahatlatch River rafting with yoga and daily personal development sessions (NLP workshops). The Goddess Connection Retreat offers the perfect combination of tranquility and adrenaline. Whether you are paddling on the river or resting in savasana you will restore mind, body and soul.